SJ: How did you get interested in researching and writing a book about Knutsen and Weissenborn guitar? How long did it take you to actually write the book? TN: It began with an interest in learning what led up to the invention of the Dobro and National tri-cone guitars. I had a small collection of steel guitars, and I was finally able to buy a Weissenborn at the the 1992 Seattle Guitar Show from blues musician Phil Sottile. At that same show, another young man and I were reaching for an odd-looking Hawaiian guitar. That’s how I met Dan Most. The guitar was a Knutsen Harp Hawaiian guitar. Dan already had an array of Knutsen harp guitars, but knew very little about Chris Knutsen. And I knew very little about Hermann Weissenborn. But we were both passionate about our respective instruments, and Dan suggested that we take some photos and create a calendar. But as we gathered information (and guitars!) and did the research, the project morphed into a book. The research was tedious. There was no internet nor digital cameras. But as each bit and piece was uncovered, we fitted it into a story that grew by expansion over a period of seven years. We decided early on that the focus was to be on the instruments and not personalities. Except for Neil Russell’s Dyer Harp Guitar and Phil Sottile’s Kona, all the guitars in the book belonged to Dan and me. 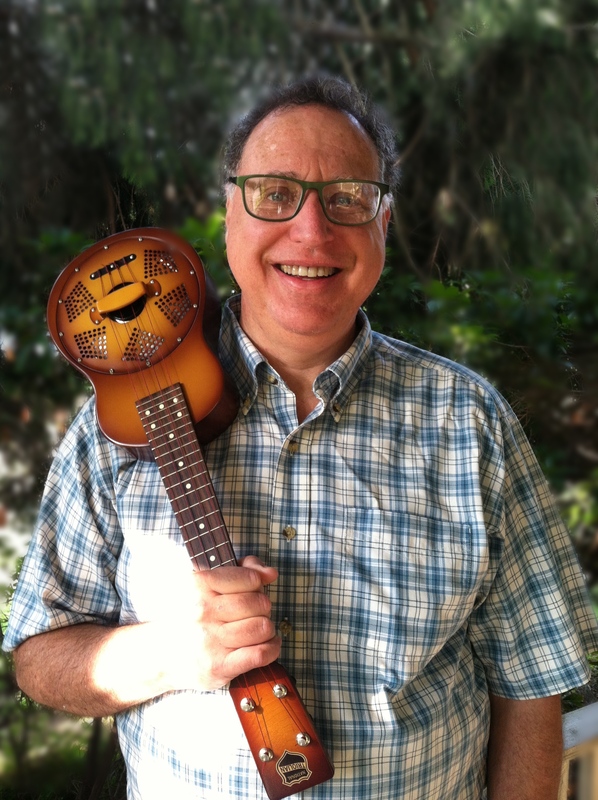 SJ: How did a German immigrant come to build Hawaiian guitars in Los Angeles in the 1920s? Where did the original design for Weissenborn guitars come from? 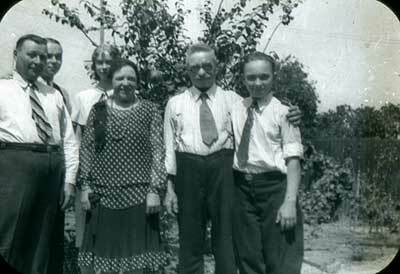 August Mayer + Mrs. Mayer – August was the bookkeeper for Hermann Weissenborn’s guitar business. TR: Hermann Weissenborn was at a crossroads in late 1912. He had left his piano-building job in New York City to make violins with master violin maker Fritz Pulpaneck in Los Angeles, whom he had met in the piano factory. Even though the venture was called “Weissenborn & Pulpaneck, Violin Makers,” Weissenborn was relegated to an apprentice role, and soon the venture failed. Hermann leased a shop at 527 East 12th Street, to refurbish and repair pianos, the only trade he really knew. He hired a live-in housekeeper, 20-year-old Concepcion Ybarra, who had been recruited from Mexico to work in the non-union garment industry in Los Angeles. Concepcion could speak English, and she could play guitar. In her spare time, Concepcion took Hawaiian guitar lessons from Charles S. De Lano, who had a studio nearby. A loaner guitar Concepcion brought home to practice with changed Hermann’s life. The guitar was one built by Chris Knutsen in Seattle, Washington. Hermann set about copying the guitar, and a new venture was born. Concepcion introduced Hermann to De Lano. This was probably by mid-1913. Over the next two years, Hermann built almost three dozen steel guitars, mostly of what would become the Style 2 platform, with varying body depths from just one inch thick to William Pester’s 4-inch deep bodied Style 4. 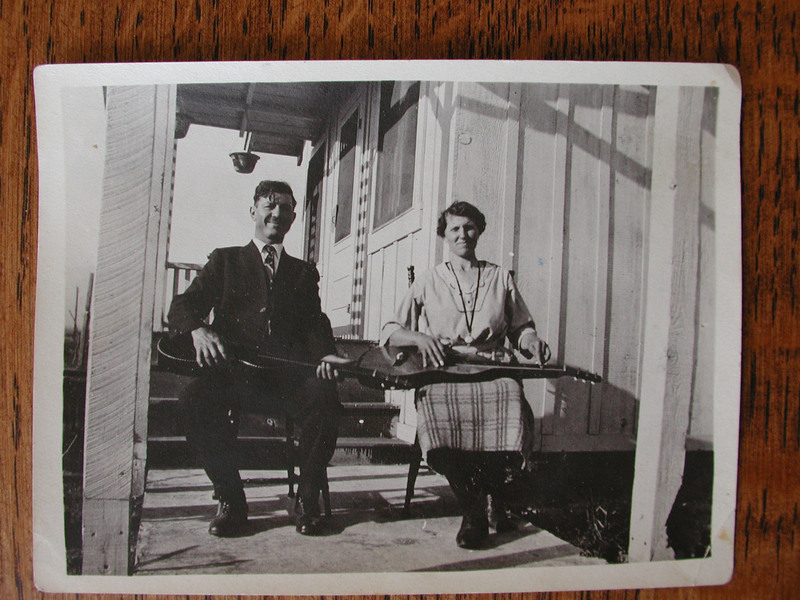 SJ: Was Hermann Weissenborrn the originator of the hollow-necked steel guitar? 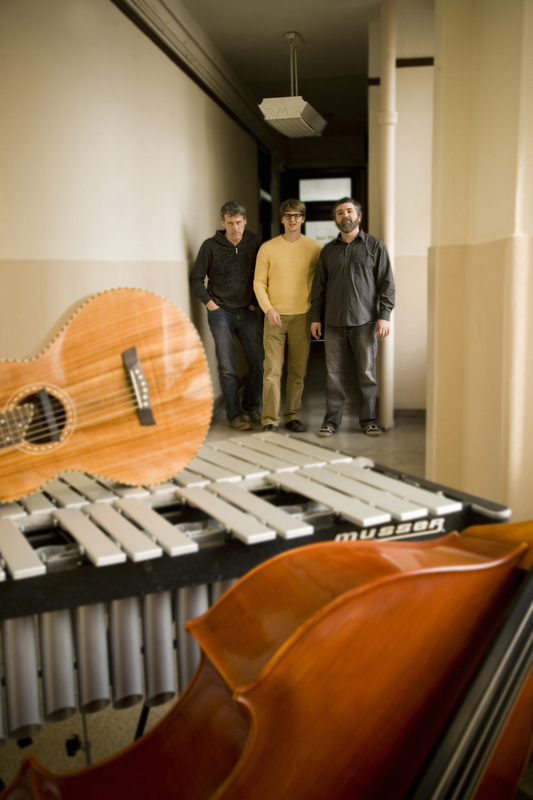 TN: The first hollow-necked steel guitar as we know it was created by Chris Knutsen in approximately 1909. Knutsen was known for his amazing resonant harp guitars, which had a hollow arm projecting from the upper bass bout and supporting sub-bass strings. 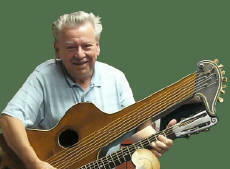 Knutsen realized that if he “straightened” the harp arm and made a hollow box-like structure for the neck, he could make a steel guitar with improved sound quality. 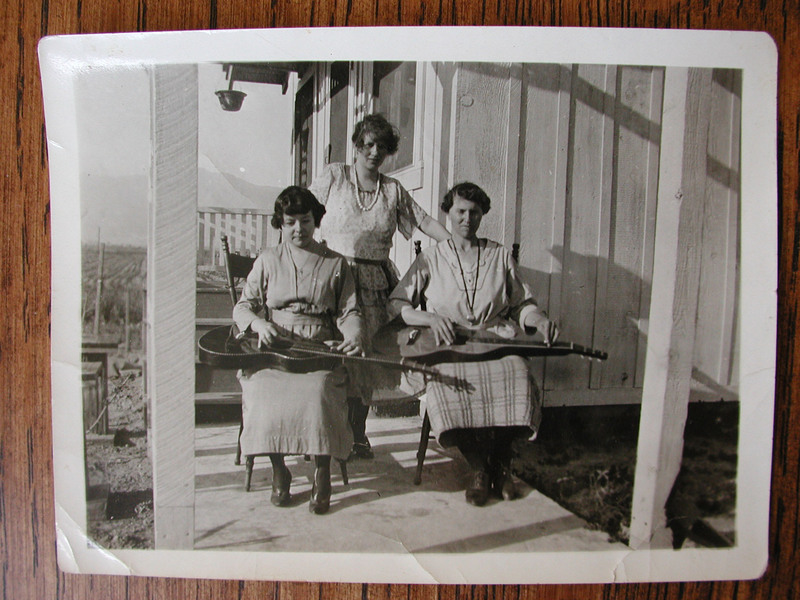 I have one of those 1909 Knutsen steel guitars, and there are photos of Willliam Pester, Palm Springs’ “nature boy” playing one in front of his hut. 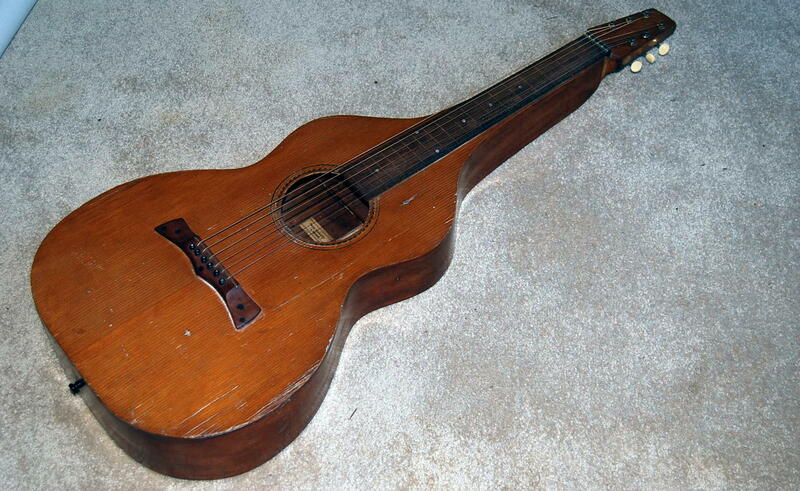 This was the guitar that Weissenborn copied and refined as he built dozens of them between 1913 and 1916. With the neck being part of the guitar body, the instruments were simple to build. 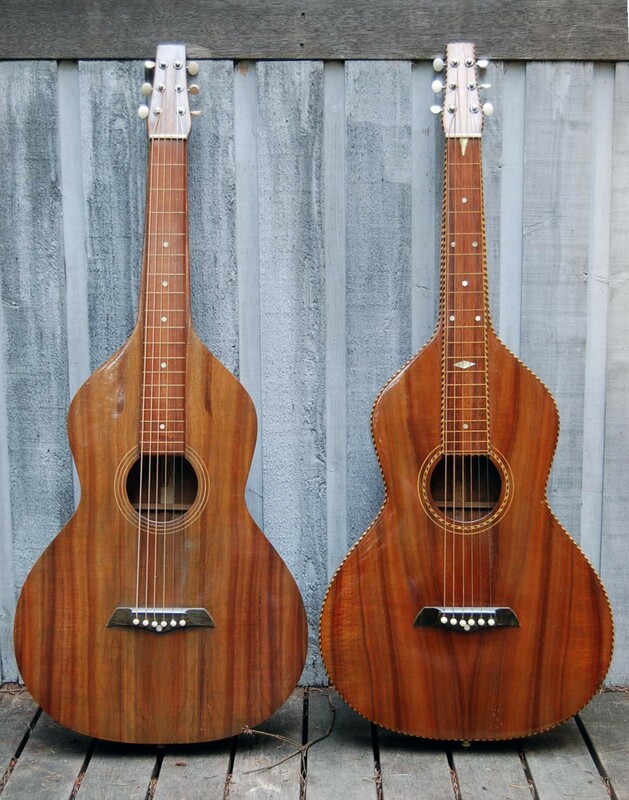 SJ: Was Hermann Weisenborn responding to a demand for lap style Hawaiian guitars or did he actually create the demand by building those instruments? Were there any famous players who helped to popularize the instrument? TN: There was a real craze for Hawaiian music during this 1913-1915 period. The recording industry churned out records, and everybody want to learn to play the Hawaiian guitar. And, of course, the 1915 Pan Pacific International Exposition in San Francisco with its Hawaiian themes and musicians helped fuel the movement. By 1916, Hawaiian music, mostly guitar solos, became the most popular form of recorded music. Music teachers, including both C.S. 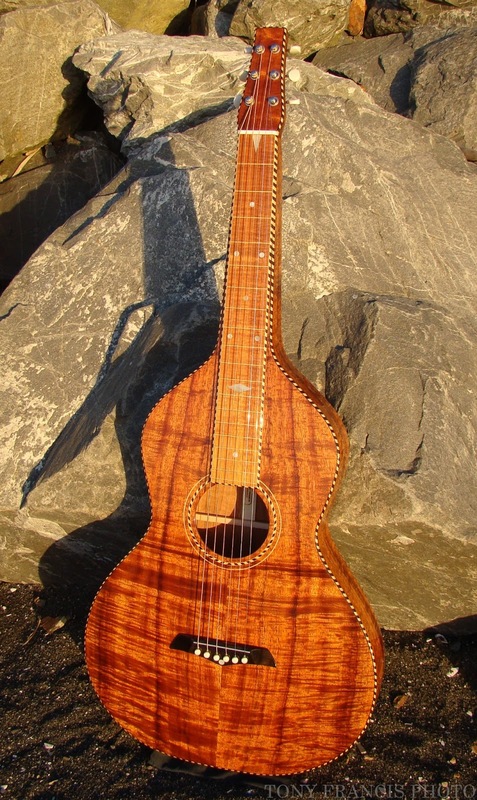 De Lano and Frank J. Hart (Southern California Music Co.), rushed to procure Hawaiian guitars to sell to their students. De Lano turned to such sources as Knutsen and the Shireson brothers before settling on Weissenborn as a supplier, while Hart turned to C.F. Martin & Co. There was a second wave of Hawaiian music popularity in 1922 when radio broadcasts filled the airwaves. The acoustic steel guitars were at a disadvantage in a band setting, however, and attempts were made to increase their volume. Then in 1926 the resophonic guitar was invented, followed in 1931 by the electrical steel guitar. There are very few photos of Weissenborn guitars being played. The 1925 Stadlmair catalog has an endorsement photo of Bessie Keaunui playing what looks like a Style 1. Noted players of the day, such as Sol Hoopii, quickly discarded guitar after guitar as Weissenborns, then National tri-cones, and then electric steel guitars passed through his hands. Famous players such as John Fahey, David Lindley, and Ben Harper popularized a revival of the Weissenborn beginning in the 1960s and continuing to the present. SJ: Did Hermann make all the guitars by himself or did he employ a staff of builders? TN: Up until 1916 Hermann built all the guitars himself. When he set up the small factory in 1916 to build Kona guitars, he hired workers because he was starting to standardize and wanted repetitive consistency. But even then, I think he continued to handbuild instruments, particularly the solid necks. It is clear he had his eye on factory production when he sent for his son in 1921 and moved the factory to a larger building at 1196 S. San Pedro. Templates were used to locate the bracing, bridge pin holes, and tuner holes. That Rudolph Dopyera was hired as shop foreman after Hermann Freidrich’s death in 1926 suggests a fairly large work force. In researching Hermann Friedrich’s wife, Ida, I found that after Hermann Friedrich’s death in 1926 she married Fred R. Meadows, who was a guitar finisher. After the introduction of nitrocellulose lacquer to finish guitars in 1927, Meadows went back into the furniture business as a furniture finisher. SJ: How did Herman come to offer the different models – style 1- 4 what were the price points and differences between those guitars? TN: By 1920 Hermann had already built examples of the four models that would become Styles 1-4. I think he received sage marketing advice from De Lano, various department stores and music stores he sold through, and from Harry Stadlmair (Henry Stadlmair’s son) who became the west coast manager for distributors Bruno & Sons. Different levels of ornamentation would satisfiy different tastes and different pocket books. 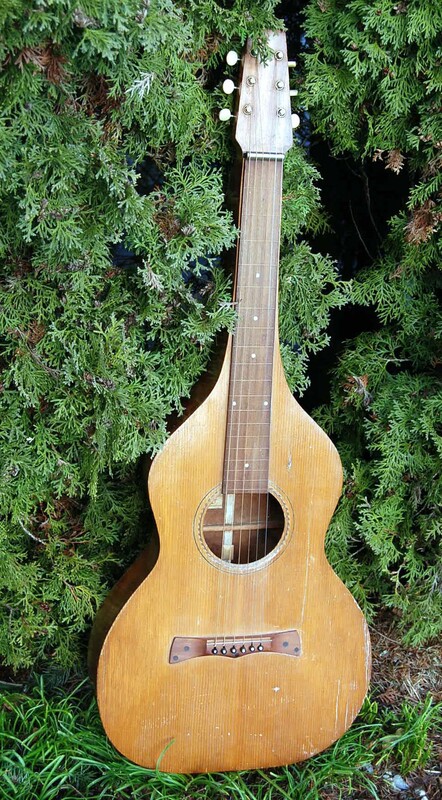 The 1925 Stadlmair catalog listed the four styles: Style 1, no binding, simple position dots–$40; Style 2, black binding, “fancy selected position marks.”–$56; Style3, rope binding around the top and fingerboard edges, “extra fancy position marks”–$67.50; and Style 4; rope binding around top and back, headstock and fingerboard edges, “extra fancy position marks.”–$79. SJ: Over the years I’ve played maybe 15-20 different vintage Weisenborn guitars. Ironically, The best sounding/playing guitars were the least expensive style 1 models. Can you give us an overview of how the production and construction of the guitars changed over the years and any insights into why certain models may sound better than others? TN: In my opinion all Weissenborns sound good. But some do sound better than others. My best sounding Weissenborn is a Style 2 with a paper label from about 1920. All four styles of guitars from about 1916 to 1926 with the 3” body depth are structurally the same except for the binding. 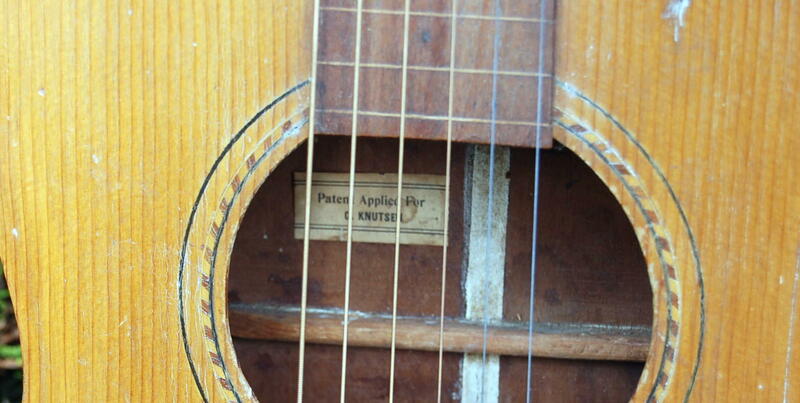 Beginning in mid-1926, efforts were made to increase the volume of the guitar by altering the top’s wood mass. Heavier braces, a larger bridge plate, and a reduced bridge size were all part of this effort. Also, some of these guitars received a heavy coat of nitrocellulose lacquer. A lot of the sound difference is in the koa wood itself. Arguments have been made about which side of the island and at what altitude the koa was grown, but it is factually true that some koa is denser than other wood, and air-dried koa has less moisture content than kiln-dried koa. Finally, the player’s touch has a lot to do with the sound. You may not know this, but one man procured and cut all of the koa wood used in Weissenborn guitars. 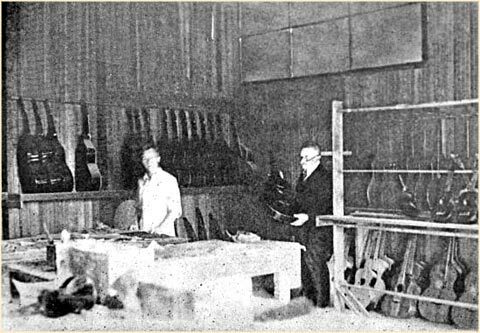 He was Albert A. Kolb, who ran the lumber yard at 9th & Main near Weissenborn’s various shops, and who was also listed as a partner in a 1926 listing of Weissenborn Co. Ltd. Diagonal saw marks from his 60” diameter saw can be seen in guitars from 1914 to the 1930s. It is evident that in the ramp-up to launching the Weissenborn factory, Kolb procured a large quantity of high-quality air-dried koa logs. Some of the most beautiful and best sounding Weissenborns I have seen and heard are from about 1920 to about 1925. Most of these are Style 1s and 4s, with some 2s. Style 3s from this era are relatively rare. The magic in these guitars is a combination of the koa wood and the hollow body design. SJ: Any insights into how Herman came to offer the teardrop model? And why are those models so rare and so expensive? TN: The teardrop model did not originate with Weissenborn. Knutsen made a teardrop model in Seattle in 1910. Andrew Groehsl offered a teardrop model in 1920. 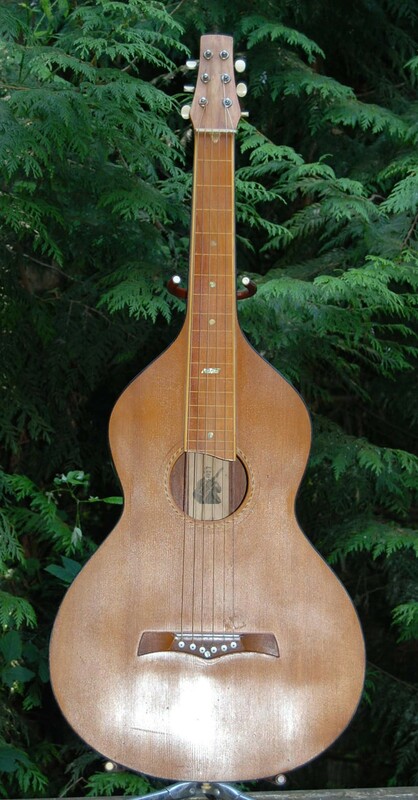 Weissenborn first offered the teardrop model in about 1926, and it is nearly identical to Knutsen’s 1910 model. No one really knows why the new model was introduced. Teardrop manufacture continued into the 1930s. But not many were made, and for that reason they are rare and highly desirable. As far as I know, they are all Style 1s. Most feature rather plain koa wood, but they have a sweet sound. I have seen serial numbers staked into the headstocks of several, usually a 3-digit number in the 6xx or 7xx range. SJ: Are there any known recordings of artists playing Weissenborn guitars from the 1920s? Were there any famous artists playing or endorsing Hermann’s guitars? TN: There are very few photographs of Weissenborn guitars being played. Prolific recording artists such as Frank Ferrera played conventional guitars with raised nuts. 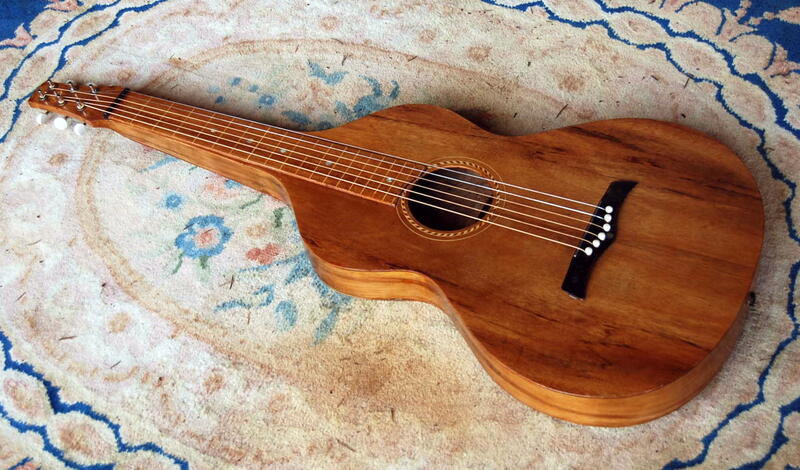 The Weissenborn guitar had a very short time window before being supplanted in 1926 by resophonic instruments. SJ: When did the factory quit offering guitars? What were the circumstances that led to this? TN: Hermann Weissenborn moved his factory to a smaller building in 1935 as the depression and electric steel guitars took their toll on the business. Hermann worked his last day on January 7, 1937 and died of heart failure at age 73 on January 30, 1937. No factory records have ever been found, and the number of instruments he made is unknown. SJ: In your opinion, was Hermann Weissenborn a genius or was he just lucky? TN: I think he was a little bit of both. To me, genius implies some superior intellectual ability. Hermann was in the right place at the right time with the right people when he started building Hawaiian steel guitars. Everything fell into place. To me, that is pure happenstance. But Hermann had the background, skills, and vision to pull off a successful venture. He was passionate about the guitars and remained focused, and he was a risk taker. Remember, Hermann was about 50 years old when he built his first guitar! I have always been a believer that you make your own luck. SJ: How has writing the book affected your life? TN: I have an extensive background in writing and doing research, both as a technical writer and as a patent attorney, and it something I love to do. Working with Dan Most was one of the best experiences of my life, and we enjoyed a great camaraderie together. It was serendipitous that my company was acquired by another and I had accelerated stock options to pay for publication of the book, or it woudn’t have happened. I was 61 years old at the time. Since the book was published in 1999, I have met many wonderful people who have enriched my life. I still continue to research Hermann Weissenborn and his instruments, and I enjoy sharing my findings with others.